When I heard about the heart of the ministry, before I got to hang out with everyone, I wondered how in the world people could create a community like the one Dry Bones professed to be. How do you bring together people from vastly different beliefs, backgrounds, and experiences and still create love, unity and vulnerability? Although there isn’t a formula for these things, and a lot of different efforts have gone into creating this environment, one thing seems to stand out as a cornerstone: eating around the table together consistently. Growing up, my mom called the idea of sitting around the table with our family the ‘Table Principle.’ Essentially, the idea was that the family would stay in relationship with one another, and communicate, if we were required to sit together for our meals. There were times that I hated this principle, there were even times when I was so angry with a member of the family that I refused to speak during these family meals. Somehow, no matter the issue, everything seemed to be resolved, or at least dealt with, when we were done eating. This is the magic of the Table Principle. Not only does gathering around the table nourish our bodies, but it provides an opportunity for our minds and hearts to be nourished as well. One of our friends said last week, “I have had some of my best conversations over food.” What a powerfully binding thing for all who participate. What an amazing opportunity to speak and listen to one another. What a magical way to meet our physical needs along with all of our other needs. It is so simple, and yet so powerful because every single one of our friends knows that there is always a seat for them at the table. They have a place to come and be refreshed in all the best ways possible. 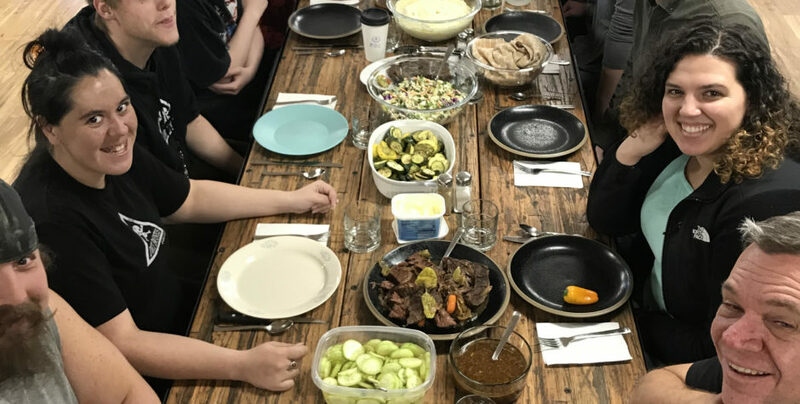 This large wooden table, that was made just for us here at Dry Bones, has become a place where people listen, physical needs are met, and hearts come alive. I am grateful for knowing that this is a space in which I belong, and that there is a place for me at the table.